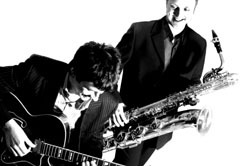 Acoustic Jazz Duo are perfect for creating the beautiful background music and exquisite ambience needed for an intimate wedding, to corporate event. Acoustic Jazz Duo are perfect for creating the beautiful background music and exquisite ambience needed for an intimate wedding, to corporate event. Add a touch of elegance and please even the most discerning music lover at your next event. Whether they are performing for an Intimate Wedding, or a Large Festive affair, the elegant sound of the Acoustic Jazz Duo will provide beautiful background music with an exquisite ambience, perfect for your function.